With more than six decades of experience in compressor manufacturing, Emglo holds a reliable status in tools industry with their professional grade heavy duty compressors that exhibit quality and class at the same time. Emglo is a subsidiary of Stanley Black & Decker and it has maintained the legacy of its parent company with more than a few industry-first innovations. 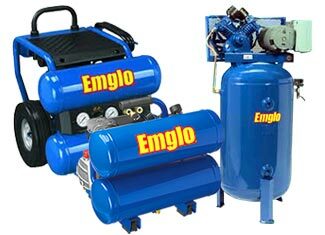 Your Emglo compressor is a combination and assembly of well engineered parts that can go defective with time. Sometimes excessive usage or an accidental mishap is the culprit. In such circumstance, ToolpartsPro comes to the rescue with complete range of genuine Emglo parts that restore the quality and functionality of your reliable compressor. At ToolpartsPro, we offer Emglo replacement parts at reasonable prices and these services are very well complemented by our amazing customer care staff and technical support. Search the required part or call us at our toll free number 888 982 6540 to hold verbal enquiries.